The Osun-Osogbo Sacred Grove is a sacred forest that is the cradle of Yoruba cultural traditions. It is the domicile of Osun, the Yoruba goddess of fertility. The site consists of 40 shrines, 2 palaces, and many sculptures and other works of art. It is believed that Oso-igbo, the goddess of Osun River, was the Queen and original founder of Osogbo. She was credited with many important achievements, which helped to establish the State. She lived in a beautiful surrounding and possessed magical powers, which inspired her people and frightened their enemies. Traditions acclaim her the goddess of fertility, protection and blessings. She possessed the ability to give children (through birth) to barren women and power to heal the sick and the afflicted by means of her medicinal water from the river. My experience as at yesterday sunday 1st of December 2013 was one of the best i've ever seen, the status was 1st ever seen and one of the best seen. I saw d sherin and the magical rival and I was told what to do with the water and I should also drop any amount of my choice of which I did.1st, on our arrival the place was so silent without sound which scared us to death. Along the line we were able to build up our mind to move away from the magical rivel to another part of the osun,I try all I could to see anyone around to tell me what to do with the magic water.after 30minutes later we saw a woman and d husband in charge of d magic water who instructed me to ask what ever I want from d magic water and watch my head with it and after that I notice I was at peace with my spirit. We also notice some pictures we took did not turn out well as expected.above all is a place to be. In 1968 I was working in the area (at Effon Alaye) and stayed in Ilesha which is a town some 15 miles from Oshogbo. I visited the shrine on numerous occasions when there was noone about. It is in the forest, very quiet and an air of mystery surrounds it. It is good for quiet reflection. I attended osun osogbo festival 2008 when high personal individuals also were present. Among others were The osun state Governor, Prince Olagunsoye Oyinlola, The Odua Peoples Congress leader, Chief Gani Adams, HRM. The Ata-oja of Osogbo, Chief Fasasi Olabankewin (DAGUNRO) and others. In short, it was fantastic. Osun Oogbo Sacred Grove is a place to be, unfortunately most inhabitants of the town hardly develop interest to visit the grove,for reasons best known to them,some claim that the weird nature of the grove could pollute or adultrate their spirit being.On the other hand,Osun devotees almost on daily bases,to pay homage to the river goddess and the various deities,as well as offer necessary sacrifieses to the gods. I have been to the place several times, either on personal visits or sight seeing with visitors or tourist. Whatever nature offers us should be appriciated because nothing can be as natural as nature. In conclusion, Susan Wenger has been able to creat objects of habitation for the deities in the grove,some having very weird, astonishing forms, but all the same they remain spots of certain deity/god to be worshiped. It is best visited and seen than reported..... be there to see. I shall never forget my visit to the Osun Shrine, sacred grove and oracle in 1977. My companion was a Catholic priest from Oshogbo. We stopped first at the home of Ms.Wenger. The sight of her descending the staircase of her home leading on a long leash a dog that resembled a great Dane ,for all the world, looked like the figure of Diana of the hunt. The Catholic bishop of that diocese had arranged for us to visit the oracle of Osun. On the way to the oracle we beheld the majestic sculptures of Suzanne Wenger. At the place of the oracle of Osun, the four of us--the young priest and I a Japanese-American art professor from California and his son, were expected to perform, on our knees, a symbolic lustral cleansing by throwing our hands back over our shoulder. Then we were each in turn given a kola nut and asked what it was we wished for and to tell it to the kola nut in our hand. In a low voice only I could hear I wished for reconciliation between the Christian and Yoruba beliefs. An attendant rang a tiny bell and I was told that I had come in peace and I would go in peace, which I did, leaving behind a lingering memory of Ms.Wenger lost in meditation beside the river. It was 1968. I was working at Unife ( now OAU) just down the road. I visited the shrine of Oshun in her grove of wondrous light and breath-taking beauty. Bright, sweet, cool waters flowed in her valley. I felt her presence. I offered prayers, and left my offerings. It was a very special time. It has remained with me always. Attached is the pic I took. Curious. I was with a woman who was, and indeed has remained, very special to me. It was she who brought me to this grove, to greet the Goddess (that is she in the pic; a friend of Suzanne Wenger). Life's moments in time. It was these things, these experiences, like here at this magical sacred grove, which enabled me finally to grow; to become the whole man that always had been there. I was a starving man. Nigeria provided the nourishment I so greatly needed. And the people easily sensed this. And how much they helped. I just returned from Osogbo on Monday past. I went to the Osun grove and was amazed by the beauty of the grove. Sadly, Ms. Wagner, the artist who did the incredible sculptures in the grove passed away a few months back. But her lovely home just outside the grove is still there and it is amazing to see. I didn't go in but I did snap a photo. We walked to the river and put our feet in the water. We posed with the statue at the river. It was an amazing, amazing experience. After reading about the Osun River and the Grove, I had never thought I would be in Nigeria to actually see it in person, yet there I was standing in the Osun River. There is a certain feeling to the place. I felt like things were vibrating around me. We prayed at the shrine with the Osun priestess which was very interesting. Too long to go into here, but that alone was worth the trip. I can't say enough about how great an experience this was for me, particularly as a daughter of Osun living in "the states," it was very meaningful for me to see the grove in person. In 2006 I travelled on a trans Africa tour and in May we found ourselves spending a few days is the suprising artist community of Oshogba. Here in the small Nigerian city were art galleries and workshops of extraordinary variety. Artists come to Oshogba because of the Osun-Osobgo Sacred Grove and the inspring art of Suzanne Wegner. A group of us hired a guide who walked us through wood and field and finally to a lane on which the entrance to the shrine opened. It was weekend and from the loneliness of the the walk we entered into crowds of vistors to the Scared Grove. As the only caucasian people around we attracted a crowd of the very friendly Nigerian people who were curious to know of our visit and extremely proud to show us this site. Of course the highlight of this visit, besides the warmth of the locals, was the art of Ms. Wegner. Extraordinary and unearthly, the sheer size of her sculptures along with the number of them (obviously the work of a lifetime)made one feel the magical qualites of this river and grove, something which the local people firmly believe. After a visit to the shrine our guide took us into town and showed us Ms. Wegners house. Covered in more schulpture of a house size scale, it was exactly as you'd expect of the artist who created the works in the Osun Shrine--remarkable. As we gazed at the works of her home our guide skipped to the door and asked for entry for us. We never expected to have the pleasure to meet her but even at the age of 92 she admitted us to her home. More amazing was how gracious, how sharp minded and how full of thoughtful conversation she was at that age. Clearly the spirit that moved Ms. Wegner to create the art at the Shrine still fueled her mind and imagination. We were honored and overwhelmed. I encourage everyone to visit this world heritage site. You will be impressed by the Nigerian people, the Shrine and the art of Ms. Wegner. The addition of the Osun Shrine to the WHS list in 2005 brought back memories of my visit to it during travels around Nigeria in 1975. Nigeria wasn’t and, from what I read, still isn’t really a country to travel around “looking” at places. One could hardly recommend anyone to take a “holiday” there! Dealings with individuals can range from the rapacious, through hostile and unhelpful to extremely kind and friendly. The mere logistics of travel can be very wearing. To get the most out of Nigeria you need to have or to engineer an entrée to its society. By lucky happenstance through a chance travelling companion (I hope the last 30 years have treated you well Judith Barrett of Vancouver!) I had somehow got involved with the artistic and music scene around Oshogbo (a centre for such activities). This included meeting and staying with Twins Seven Seven – now apparently a grand old man of the African artistic scene, highly feted in USA and “owner” of some 6000 Web entries (I note that he has even recently been designated himself by UNESCO - as an “Artist for Peace”! How many “lists” does UNESCO have?). Also with another, albeit less renowned, artist Sam Babarinsa (though I note he still has some Web entries!). It was Sam who took me the short journey from his house in Oshogbo down to a forest grove by a river. 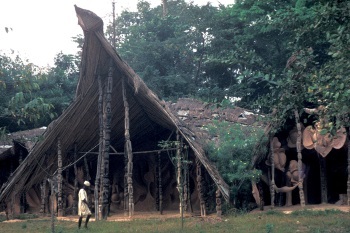 This was the Osun Shrine – a place I noted as being “full of mystery”. We walked through a series of clearings with structures, sometimes thatched and sometimes with corrugated iron roofs. There are many statues and the largest are enormous creations of shaped mud cement often in the form of “gates” through which one enters a shrine. These were created by Susanne Wenger, an Austrian woman who had arrived in the 1950s and set about reconstructing and refurbishing the shrine collaboratively with locals. In an effort to preserve the shrine she re-erected the wall which marked the sacred precinct. So complete was her commitment that she married a local, became a priestess (or “Olorisha”) and a senior member of the “Ogboni” society. The photo is of a shrine which is one of her works and represents the meeting of Obatala and Shango, 2 Yoruba deities (Oshun herself is the river goddess of fertility). 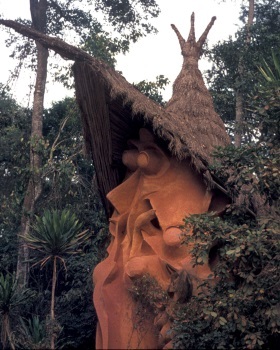 One of the shrines is designated to the Ogboni secret society, an “eminance grise” in modern Nigerian politics with a reputation whose nearest Western equivalent might be the Masons but whose political and judicial writ may well go rather further! Looking back, despite Sam’s efforts to introduce and explain, I see the visit as a wasted opportunity – there is so much now I would like to know whereas in those days I didn’t even know I didn’t know! It is still something of a surprise to me that this shrine “rescued” by a European and decorated in a style which is only partially “African” has become such an important place in Nigeria’s contemporary culture – such that Nigeria has chosen to have it inscribed as a WHS! In fact, after even a little study about this place (there is quite a lot on the Web) one begins to realise how much it can tell one about Africa past, present and possibly future and also how much of Africa is unknown and possibly even unknowable to a European (Though Ms Wenger seems to have made a good try! Coincidentally she celebrated her 90th birthday on Jul 4 2005 just 11 days before the Osun Shrine was inscribed. ). So, if you do “brave” Nigeria, by all means visit the Osun Shrine – but do some prior study and try to get involved with the locals. Secret Societies: "The Ogboni society is an elitist society of men of influence who wield considerable economic and political power. They hold their meetings in the cult house once a week."